VATICAN CITY (CNS) — If the process of respectful listening and dialogue endorsed and experienced at the Synod of Bishops on the family were applied at the local level, it would mark the end of an era of judgment and the beginning of “a church of tenderness toward everyone,” said a synod father. “It could be the start of a new church” that welcomes, accompanies, listens and “also speaks clearly” about God, Bishop Lucas Van Looy of Ghent, Belgium, said at a Vatican news conference Oct. 23. If the synod experience were embraced by the whole church, he said, “I would say that it is the end of judging people, the end of a church that casts judgment over every situation,” he said. The 74-year-old bishop spoke at a briefing with Cardinal Gerald LaCroix of Quebec and Ghanaian Cardinal Peter Turkson, president of the Pontifical Council for Justice and Peace. The three prelates told reporters that the synod was transformative and enriching because they experienced the approach of dialogue and respect that was often highlighted as the pastoral approach needed for today’s families. “We lived through three weeks of listening. It is not just a theory that in order to evangelize we must listen. No, we had the experience” in and outside the synod hall to listen and to respect and receive people, said Bishop Van Looy. The synod was about presenting a Christ-like attitude, rather than fixed answers, the cardinal said. 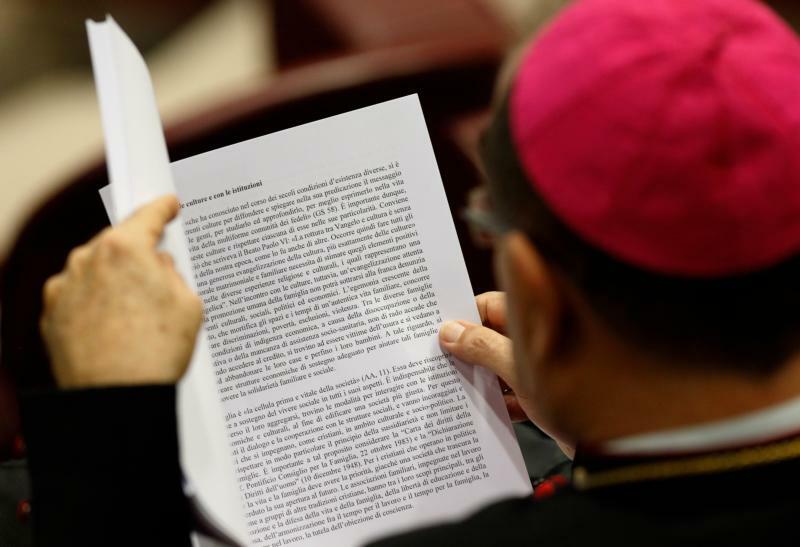 One reporter asked whether the final report coming out of the synod would be watered-down or weakened out of concerns that a “strong” proposal or language would fail to find broad acceptance during a paragraph-by-paragraph vote set for Oct. 24. Cardinal Turkson said the point of a synod is not its final written report, but the process. “The thing about the synod is learning also to appreciate another person’s point of view. And that may not be your point of view, but you accept that this is also the situation they have experience of,” he said. Also the final report should be broad enough to cover many bishops’ situations and cultures, not just one’s own, he said. Also, just because it would be impossible to include in the document everything that was discussed and debated over three intense weeks doesn’t mean all that information would somehow be lost, the Canadian cardinal said. He said there is also abundant written material that synod members handed in that the pope can consider as he continues with his ministry and the potential development of a postsynodal document, if he chooses to write one.